Goa Board of Secondary and Higher Secondary Education invites application under the Central Sector Scholarship for College and University Students implemented by the Ministry of Human Resource Development, for all class XII pass out students. Students just follow the below steps to apply for the Central Sector Scholarship Scheme Fresh & Renewal 2018-19. Step 2 : For Fresh Registration students click on the New Registration link in the home page and Fill the required details to complete your Registration. 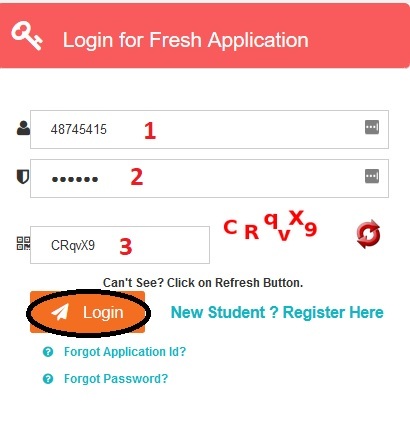 Step 3 : For Renewal case, Students Click the Login link and enter your Application Id, Password, Captcha image for Login. Then complete your renewal process. ** The total number of scholarships are divided amongst the State Education Boards based on the State‟s population in the age group of 18-25 years, after segregating share of CBSE and ICSE on the basis of number of students passing out from various Boards in the country. ** 50 % of the scholarship is earmarked for girls. ** In case of shortfall in the number of applications, the scholarship slots could be inter-changed. Last Date to submit your application form is 31-10-2018.